Yuelu Academy is situated at Hunan University in Yuelu Region Changsha County, which has a three-kilometer distance to the downtown. The floor space of the academy is more than 31000㎡ and the construction area reaches 11000㎡. What’s more important is that the Yuelu Academy is listed as the national AAAA scenic area, national key Scenic Spot, national civilized tourism demonstration site and important heritage site under state protection. Nowadays, it serves as an ancient heritage museum for demonstrating the ancient academy education and architectural style. 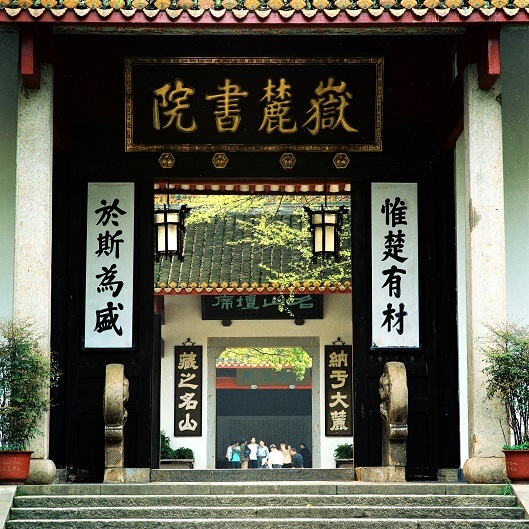 Yuelu Academy was built in Kaibao 9th year in North Song (A.D.976) and ranked one the four ancient academies, having gone through several dynasties covering Song, Yuan, Ming and Qing, in 1926, Yuelu Academy ultimately renamed Hunan University. Recently, it serves as an academy for fostering masters and doctors. Since it is the best-repaired, fullest-conserved and largest-scaled ancient academy, it is honorably called “A Millennium Academy”. In recent years, it has received more than 650 thousand tourists from all over the world and gradually become a center for collection, display, research and communication of academy culture relics. Yuelu Academy has been well-known since Song Dynasty, and was under the title: one of the “Four Best Academies in the whole country”. During its thousand years, Yuelu Academy has been much popular for the famous people it has fostered. Between 1916 and 1919, young Mao Zedong lodged at the Banxue Room in Yuelu Academy several times to work on the revolutionary activities in seek of the truth of saving the Chinese people. From then on, large numbers of Yuelu teachers and students set themselves to the revolutionary work in the new democracy and caused a profound and ever-lasting influence to Chinese history. Additionally, the academy is also famous for the elegance of the environment and beauty of the architecture. The extant architectural complex nearly was built in Ming and Qing Dynasty, of which the main architecture was lecture room, library and Confucious’ Temple in the function of teaching, collecting books and sacrificing.